As always, VENUE software updates are a combination of user requests, new functionality, and bug fixes. For this VENUE 5.6 release, we’ve taken the requests from monitor engineers around the world and implemented their most desired features and added that to the ever-growing list of S6L capabilities. 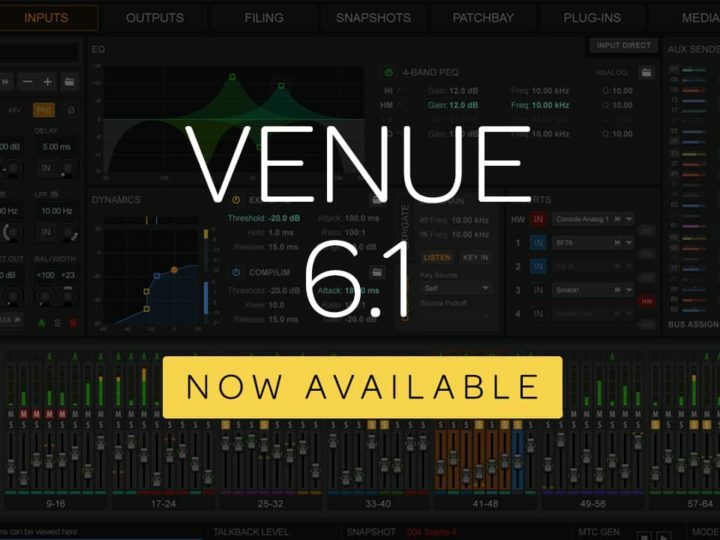 VENUE 5.6 is intended to make a monitor engineer’s life much simpler, and certainly offers them more customizable workflows on the S6L. VENUE 5.6 is now available to download at no charge if you have an S6L system and a valid Avid Advantage Elite Live support contract—you’ll find the installer in your Avid Account. Give your musicians control—with the introduction of the VENUE | On-Stage iOS app, allowing control of mixes using mobile devices. 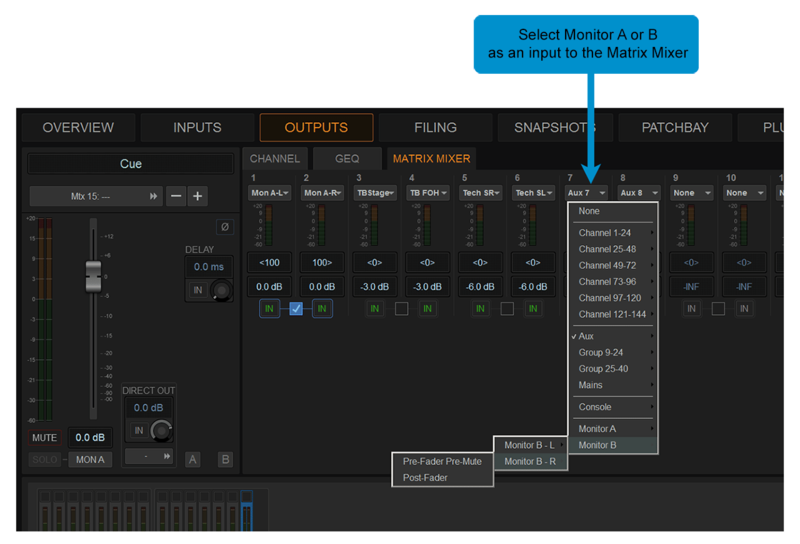 Simplify your cue workflow—Monitor A and B added as input sources to the matrix mixer. 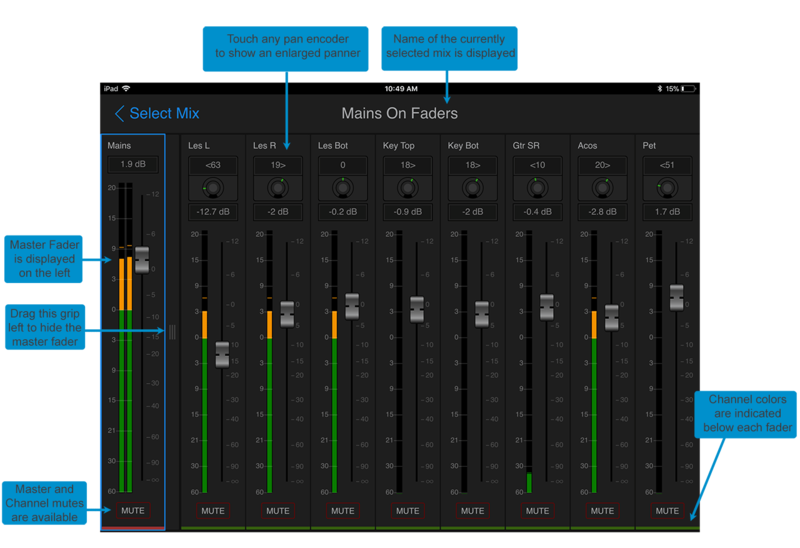 Faster access to more mixes—enjoy an improved Sends on Faders workflow. Greater I/O options—use any stage or console I/O for hardware inserts. More control and customization—with a range of new control surface and software workflow enhancements. 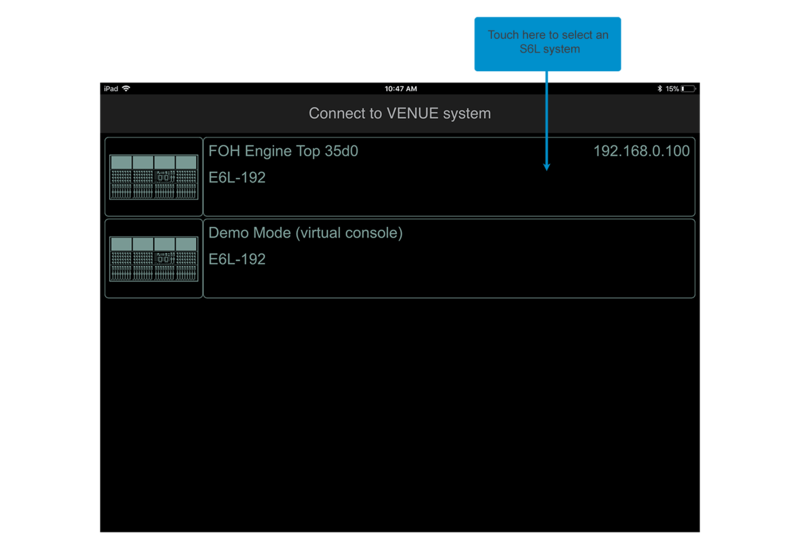 Let’s start at the top, with the number one request from VENUE users—the iOS remote app. 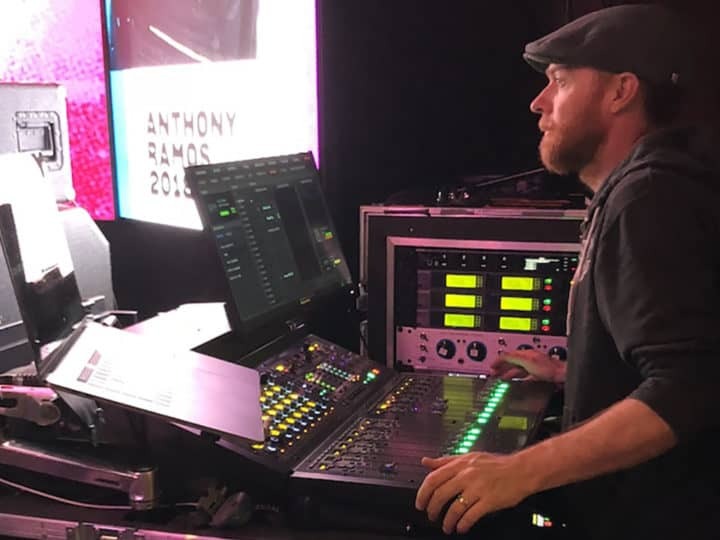 With mobile devices in the hand of almost every musician and engineer, empowering musicians to control their own mixes eases up the workload on the monitor engineer and removes the need for a heap of hardware and cables. At the request of our users, we’ve developed a free app that works on all iOS devices (running iOS 10 or newer), that enables control of all levels and pan to aux mixes, as well as level, pan and mute control of the mains mix. 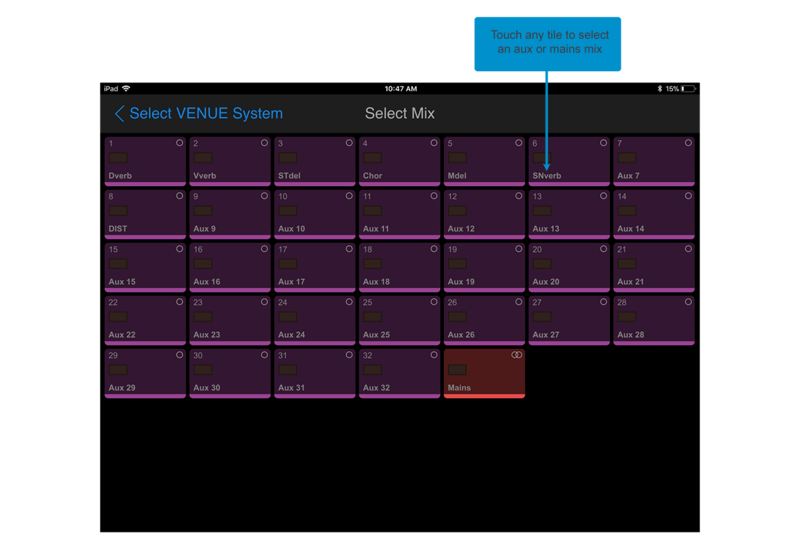 With this easy-to-use app, up to 16 users can simultaneously connect to a single VENUE | S6L system and each choose a mix to control. It’s as simple as plugging in a WiFi Router to your S6L’s ECx port, connecting to that WiFi network with your iOS device, and opening the app. Every connected S6L will show up as a system available for connection. Just click the system you wish you connect to and you will be shown a list of available mixes on that system. Touch the mix you wish to modify and you will see all of the member faders of that mix on your screen. Scroll to any send you wish to modify and turn it up or down. If you’re modifying a stereo mix, you’ll see a pan knob above each fader. To pan any send, click the pan knob and a large pan encoder will pop up—click the center of this encoder and drag in the direction of the desired pan. The app even offers a ‘Fine Mode’ for those of us with smaller devices to allow users to make detailed changes to levels. As input lists grow, shows can get complex and every little detail and nuance must be caught by the engineer. A large number of musicians these days are on in-ear monitors, and as an engineer, IEMs can make it hard to listen to talkbacks from various techs and engineers through a ’squawk’ or shout box. In VENUE 5.6 we’ve added the ability to add Monitor Bus A or B as an input source to any Matrix. This new feature allows an engineer to feed both what they’re cueing and up to 22 additional talkbacks or submixes to their own IEM cue pack (23 if you use Monitor A or B as a mono input). How does this work? Navigate to your Outputs tab, and select any matrix. If you tab over to the matrix mixer, you will see up to 24 sources available as inputs to your matrix. Clicking the input source in the matrix mixer will open a drop-down menu that shows all channels and busses available within the console. At the bottom of this list is ‘Monitor.’ Within ‘Monitor’ the user has the ability to select Monitor A or B as sources to the Matrix. Additionally, it offers various pickoff points wherein Pre-Fader is before the monitor level knob/fader, and Post-Fader is after the monitor level control. Since each matrix mix is independent, an engineer may choose to feed Monitor B Pre-Fader, to mono Matrix 1 and Monitor A Post-Fader to stereo Matrix 2 or any other variant. To add talkbacks to these matrices a user simply has to add the talkback channels as additional matrix input sources, and turn them up. 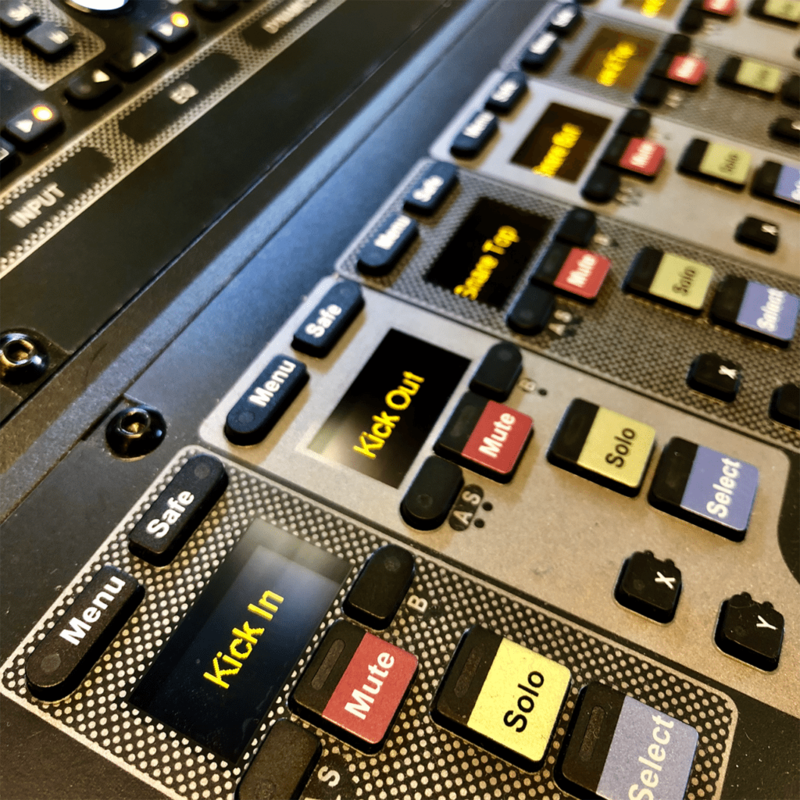 Don’t forget that matrix sources are all snapshot-able and accessible within Events, so an engineer could change the talkbacks on a per song/snapshot basis, or even use function switches or GPI footswitches to turn talkbacks on and off into the matrix. When you’ve got an artist that’s clearly the boss, and musicians that stand second tier, there is often the desire to keep the boss on cue, even when others request changes. S6L has always provided engineers with immediate access to 96 mixes with a single touch, but with VENUE 5.6 we have added the ability to enter Sends on Faders mode without having to Solo the mix. This means you can keep your artist soloed to your cue pack, while flipping other mixes to faders. Simply enable SOF mode on the MTS, and touch any Aux tile. This will enter Sends on Faders mode for that aux without Soloing the aux. Touch another tile to jump straight to SOF mode for the newly selected aux. Don’t forget SOF also works for matrixes, allowing a user to use physical faders to control the contributions to any matrix. You can also use SOF mode in conjunction with other fader modes, such as Spill mode. This gives an engineer the ability to enter Sends on Fader mode for a specific aux, while simultaneously showing ONLY the members of that aux. This means that if an engineer had both SOF and Spill modes selected and touched a vocal reverb Aux tile, then not only would the faders flip to the send, but it will also only show you the faders with the vocal aux send ON. 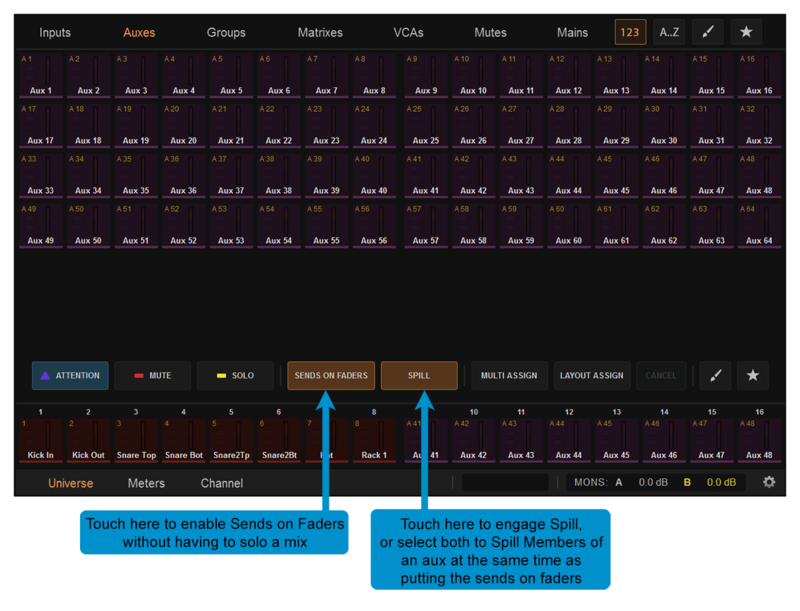 Speaking of Spill, there are multiple ways to enter Spill mode—from the MTS and from the Control Surface itself. Currently, when spilling from the console, a user simply finds the output they wish to spill, and double clicks the attention key. This spills all members of the output to the entire console, and can hide the original output fader. In order to exit Spill, a user must click the attention key of that output again, click cancel on the MLM, or click Exit Spill on the External GUI. In VENUE 5.6 an option has been added (which is on by default) to automatically position safe the output master that is being spilled anytime Spill is engaged. What this means is when a user double taps the attention key to engage spill, that user can modify the members and click one more time to exit spill without ever lifting his or her finger or having to look to find a button. Position Safe, while similar to bank safe, is not affected by ‘disable bank safe’ commands from Events. 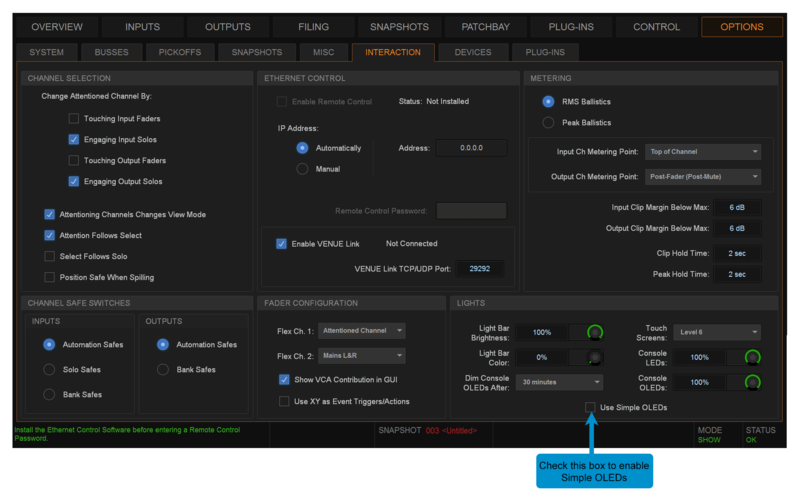 Since adding support for the Stage 16 for S6L users have been requesting the ability to use it as additional hardware inserts for their VENUE system. Imagine mounting a Stage 16 into the rack with all of your hardware inserts—that just means an Ethernet pair gets you into and out of that rack, with no need for snakes or mass connectors. VENUE 5.6 not only offers that, but also goes a step beyond that, opening up ALL stage I/O to be available as hardware inserts. 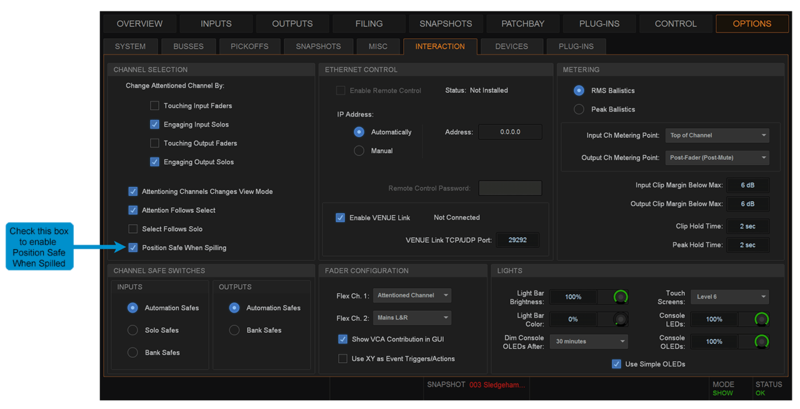 This means that any Stage device connected to your VENUE | S6L system can use a matched pair of inputs and outputs for inserts. 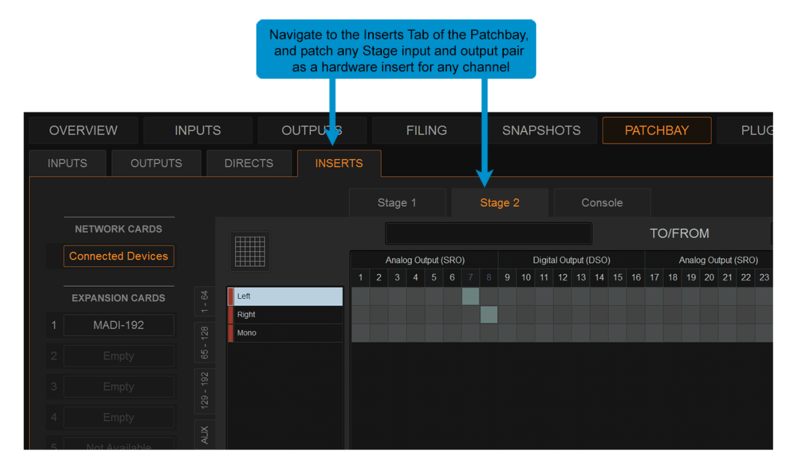 Navigate to your patchbay and tab over to Inserts. You’ll see that all connected stage devices are available. In order to use a stage device as a hardware insert, a matching input AND output must be available—meaning input 1 and output 1, or input 32 and output 32. 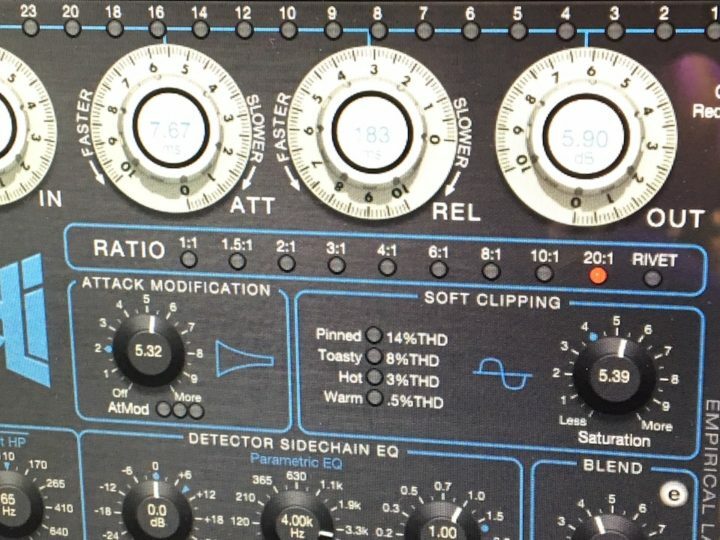 S6L has always provided a lot of information in the fader OLEDs: Channel Type and Number, Channel Name, Input Source, Output Destination, and Fader Value—it’s a lot of data to see all the time. Users had requested that we offer a simplified version, so of course we called it ‘Simple OLED’. Simple OLED is an option in the Options > Interaction page that a user may turn on to simplify the info shown in the OLED display (this option is off by default). When Simple OLED is active a user sees only the User Defined Channel Name, and nothing else. This should make a lot of complex shows simpler to look at! With an ever-evolving and constantly growing system, VENUE software will never be ‘done’. 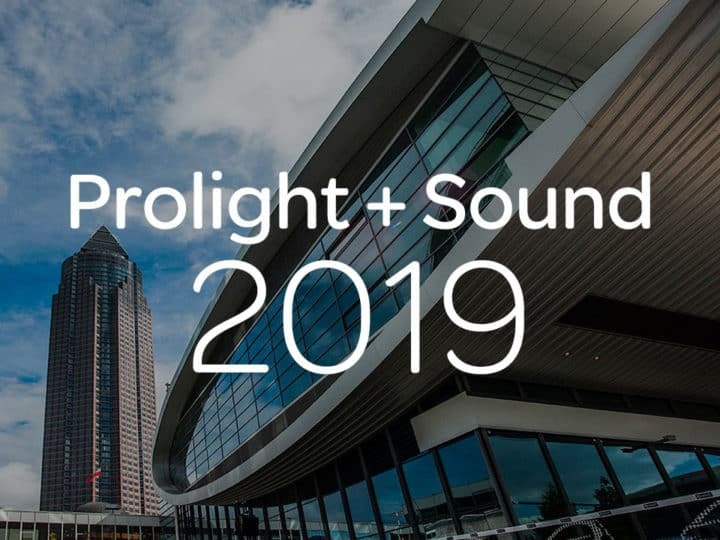 VENUE systems will always be improving through new development, and we look forward to continuing to pioneer in the world of live sound with your invaluable insights and feedback.